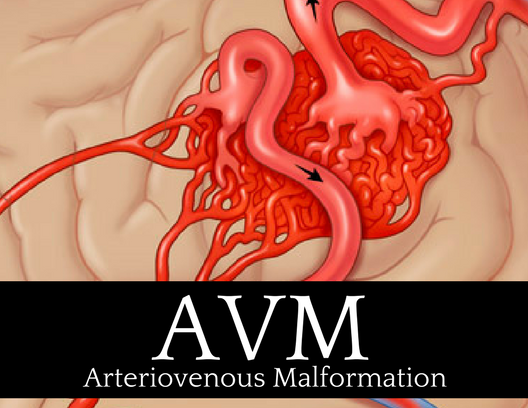 An arteriovenous malformation (AVM) is a complex tangle of abnormal arteries and veins linked by one or more direct connections called fistulas or shunts. This tangle of abnormal arteries and veins is referred to as a nidus. Normally, as the high-pressure arterial blood is pumped through a capillary bed there is a gradual decrease in blood pressure before reaching the venous system. With an AVM, the capillary bed is absent and the high-pressure arterial blood bypasses normal brain tissue and is pumped directly into the normally low-pressure venous system. There is typically high blood flow through the nidus of the AVM, but it is not known whether the flow is a cause or effect of the abnormal blood vessels, or both. One thought is that the high-pressure blood from the arterial system gravitates towards the path of least resistance. Another thought is that the AVM itself recruits blood vessels.